The Ralston Society, 1/1/1943. Hardcover. Acceptable. . Previous owners name inscribed inside. Worn cover. The Ralston Society. Hardcover. B003LV1BY4 Very Good Condition. Has some wear. Volume 1. Five star seller - Buy with confidence! . Very Good. Ralston Society, 1948-01-01. Third Edition. Hardcover. Very Good. 1954 printing. Complete 8 volume set. Books are in very nice condition. Covers have minor shelf rubbings. Your Satisfaction Guaranteed. We ship daily. Cleveland, OH: The Ralston Society, 1947. Reprint. Very Good. Copyright page lists 1941, though title pages are dated 1941. Complete in 8 volumes, each containing two lessons, bound in publisher's red decorated in blind with titles in gilt, decorated in blind with titles in gilt. Very Good, with volumes exhibiting small stains to edge of textblocks, sporadic wear or soiling to cloth with spines faded, foxing to endsheets; Volume I is slightly bowed. Ralston Publishing Co.. Hardcover. RALSTON PUBLISHING CO., CLEVELAND, OHIO, 1957. Third edition. HARD BACK RED. Book Condition:Used GOOD. 5 X 8. SET OF 8 VOLUMES IN SIXTEEN LESSONS ALL VOLUMES: gilt title on cover and spine; impressed border design on front cover and spine; light book, shelf, edge-wear, rubs, corner bumps, a few soil marks some underlining. Previous owners name in each book Title page excerpt, "Teaching, for the First Time in the History of the World, the True Philosophy upon which all Personal Success is Built." VOLUME I: The Master Mind. Small pencil lines in the margins on a few pages binding is loose. 130 Pages. VOLUME II: Definite Chief Aim Self-Confidence binding is loose. 147 pages. VOLUME III: Habit of Saving Initiative and Leadership binding is loose. 146 pages. VOLUME IV: Imagination. Enthusiasm. 154 pages. VOLUME V: Self-Control. Doing More Than Paid For. 146 pages. VOLUME VI: Pleasing Personality. Accurate Thinking binding is loose. 138 pages. VOLUME VII: Concentration. Co-Operation. 144 pages. VOLUME VIII: Failure. Tolerance. Golden Rule. 157 pages. DATE PUBLISHED: 1957 EDITION: 1162-TOTAL. Books are all intact just wear from lots of use. . Good. Wehman Brothers, 1979-06-01. Fourth Edition. Hardcover. Used:Good. 2007-01-05. New. Ships with Tracking Number! INTERNATIONAL WORLDWIDE Shipping available. Buy with confidence, excellent customer service! Success Unlimited, INC., 1979. Good. Dedicado por el anterior comprador. Dedicated by the previous buyer. Meriden, Connecticut: The Ralston Society, 1939. Rare early printing. Maroon full cloth boards, gilt stamped cover and spine design, ornate embossed border, moderate shelf wear, rub. Pages fine; appears unread. Volume VI includes lessons ten and eleven - Pleasing Personality, and, Accurate Thought. The Law of Success lessons teach, for the First Time in the History of the World, the True Philosophy upon which all Personal Success is Built. Copyright 1937, by Napoleon Hill; copyright prior to revision, 1928. 138 pages. Printed in the USA.. Hardcover. Very Good. 8vo - over 7¾" - 9¾" tall. Book. 2015-05-04. New. Ships with Tracking Number! INTERNATIONAL WORLDWIDE Shipping available. Buy with confidence, excellent customer service! 2015-05-04. Good. Ships with Tracking Number! INTERNATIONAL WORLDWIDE Shipping available. May not contain Access Codes or Supplements. May be ex-library. Shipping & Handling by region. Buy with confidence, excellent customer service! 2010-03-01. New. Ships with Tracking Number! INTERNATIONAL WORLDWIDE Shipping available. Buy with confidence, excellent customer service! 2018-05-16. New. Ships with Tracking Number! INTERNATIONAL WORLDWIDE Shipping available. Buy with confidence, excellent customer service! 2014-02-07. New. Ships with Tracking Number! INTERNATIONAL WORLDWIDE Shipping available. Buy with confidence, excellent customer service! 2018-02-13. New. Ships with Tracking Number! INTERNATIONAL WORLDWIDE Shipping available. Buy with confidence, excellent customer service! Success Unlimited, 1979. Fourth edition. Paginated by individual chapters. The classic work by Napoleon Hill and presented in a beautiful faux brown leather binding with gilt lettering on cover and spine with gilt top edge and two silk (gold and blue) page markers. Scarce edition.. As New. 2012-02-07. Good. Ships with Tracking Number! INTERNATIONAL WORLDWIDE Shipping available. May not contain Access Codes or Supplements. May be ex-library. Shipping & Handling by region. Buy with confidence, excellent customer service! 1997-03-05. Good. Ships with Tracking Number! INTERNATIONAL WORLDWIDE Shipping available. May not contain Access Codes or Supplements. May be ex-library. Shipping & Handling by region. Buy with confidence, excellent customer service! 2018-02-13. Good. Ships with Tracking Number! INTERNATIONAL WORLDWIDE Shipping available. May not contain Access Codes or Supplements. May be ex-library. Shipping & Handling by region. Buy with confidence, excellent customer service! The Silent Service: Action Stories of the Anzac Navy. IDRIESS, Ion L. and T.M. Jones. Sydney, A&R, 1944. First edition HARD COVER IN DUST JACKET. 8vo. or.cl. Illusts by Unk White. True first edition. Very good copy in edge-worn dust jacket. #AAA1. The Silent Service: Action Stories of the Anzac Navy. Buy with confidence from one of Australia's oldest bookshops established in 1975. Mokena, Illinois, U.S.A.: Napoleon Hill Foundation, 1997 hardback book in near fine condition,nice looking brown leatherette hardback book with two ribbon page markers. 5th or later Edition. Hardcover. Near Fine. 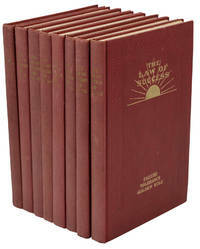 U.S.A.: Kampmann & Co, 1992 thick hardback book in fine condition,top page edges gold,two ribbon page markers, the complete [law of success]. Hardcover. Fine/No Jacket. Kampmann & Co, 1992-06-01. 50th/Lthr. Hardcover. Used:Good. High Roads Media, 2004-06-26. Revised and Updated. Paperback. Used:Good. Wilder Publications. Hardcover. 1617201774 New Condition. . New. Wilder Publications. Hardcover. 1617201774 Like New Condition. . Fine. Wehman Brothers, 1979-06. Hardcover. Good. BN Publishing. Hardcover. 9562911012 New Condition *** Right Off the Shelf | Ships within 2 Business Days ~~~ Customer Service Is Our Top Priority! - Thank you for LOOKING :-) . New.